The application supports 7 standards, automatic records transliteration from Russian and Ukrainian into English etc., i.e. 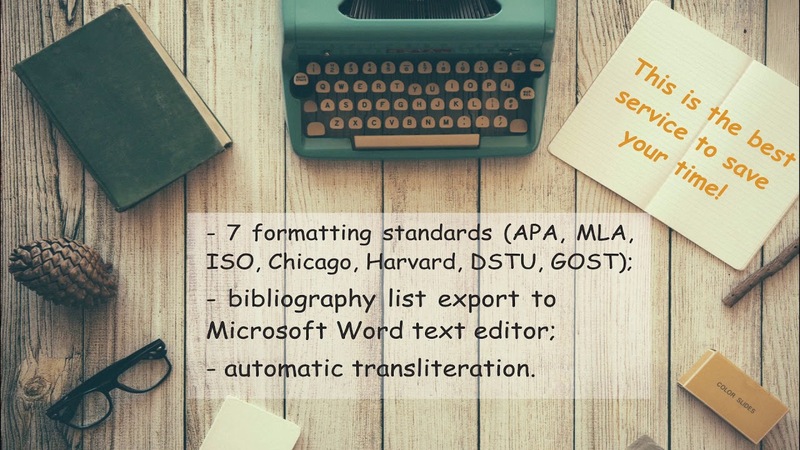 you get an opportunity to create bibliographic records using convenient template, to get one of the seven most common standards of bibliographic reference formatting, to export records to Microsoft Word and save all necessary entries to your personal repository. The application provides the access to the database of journals included into scientometric databases of Scopus and the Web of Science (about 55,000 journals) grouped by scientific fields, countries, h-index. The catalog allows the author to quickly find the most appropriate journal in order to publish their article. It represents the journals of the leading scientometric databases. It is possible to conveniently search for various journals of different countries. The application provides an opportunity to create and save the records of the author’s publications in a convenient form for the purpose of reporting. Besides, you can also save the bibliographic records that you have previously created using the Bibliography Formatting application in your personal repository. The application provides an opportunity for online style analysis, text cleaning, spell checking, text uniqueness check, usage of dictionaries and abbreviations explanation. The application provides an opportunity to select the necessary UDC code number for your article online by keywords or by a part of the code number. The application provides an opportunity to use the developed recommender system of search and ranking of scientific papers by area of expertise in scientific and technical information databases. The application provides an opportunity to automate abstracts formatting according to the most typical templates that are used in different journals and thus to reduce the time for preparing an article for a journal significantly. Our service is aimed to automate routine operations that authors usually deal with while preparing various printed materials such as automated bibliography, UDC search, appropriate journal search for publishing, text verification, style analysis, list of the author’s publications, automated abstract formatting, appropriate articles quick search. The "Database of Scopus and Web of Science Journal" application provides the access to the database of journals included into scientometric databases of Scopus and the Web of Science (about 55,000 journals) grouped by scientific fields and countries. The database allows to find the titles of the most appropriate (from their point of view) journals quickly and according to their publishing purposes. The cost of publications is indicated if it is possible. This database is also supplemented by specialized scientific journals from Ukraine, Russia and Belarus, as well as countries of Central and Eastern Europe. The application provides an opportunity to create and save a list of your scientific works for the purpose of reporting, as well as your achievements, awards, projects. The bibliographic list is created in the form of a spreadsheet that can be edited. You can also export the data to Microsoft Word. The application provides an opportunity to find the necessary UDC index-code that corresponds to the subject of author’s scientific publication including it into the system of scientific works, as well as correctly determine the LBC code for publishing the work. In addition, the use of the Universal Decimal Classification (UDC) and the Library-Bibliographical Classification (LBC) is simple and convenient. The application currently includes style analysis, dictionaries, text cleaning, spell checking, uniqueness check and abbreviation list. The service calculates a set of morphological and other linguistical attributes of a text. These attributes, in some way, characterize style of the text's author. The service is intended for words verification, spelling rules and punctuation. Text improving service helps to find stop-words in a text: linguistic trash, advertising and journalistic cliches, poor syntax features and officialese. A unique free service for bugs and typos search, spelling and punctuation verification. The online service of text verification for uniqueness shows the percentage of uniqueness of the text. Deep and quality verification will find duplicates and rewriting. The application “Recommender systems for suitable articles search” allows you to find and rank articles that are analogous by title and abstract in a certain collection of documents quickly. The user has the opportunity to connect such databases of documents independently, taking into account the accepted rules and formats. The application “Automated abstracts formatting for scientific articles” provides the most common templates that are used in various journals as well as the partial automation of their formatting during the abstracts preparation of the abstract of the article. These templates represent abstract samples of the leading scientific journals and publishing houses (universities). They summarize your paper's content for readers.